Author: Rucka, Greg Set In . . . Description: Greg Rucka has earned the kind of reputation that all thriller writers envy: his crime fiction grabs readers by the throat and compels them to read as if their own lives were at stake. Now, in an electrifying departure, Rucka creates a new kind of hero: a damaged young woman in free fall who’s not only in danger--but dangerous. Mim Bracca is riding the fast lane straight off the end of the world. Now she’s coming home without a job, without a future, and without a prayer--and only one last chance to get her feet under her, or go down forever. But home has its own terrors, including a past Mim has done everything possible to leave behind. Now that past is coming back with the shocking speed and deadly intent of a sniper’s bullet, aimed to destroy her once and for all. When Mim suffers her first blackout, waking up dazed and bloodied, she’s certain she’s hit rock bottom. She’s wrong. She’s only just begun to fall. The photos are invasive, obscene, and all over the Internet for anyone to see. How they got there, where and when they were shot, and by whom, Mim has no idea. And before the investigation into the matter even begins, a brutal murder makes it clear that whatever Mim thinks her life has been up to now, she’s about to learn it’s all a lie. The kind of lie that will kill. 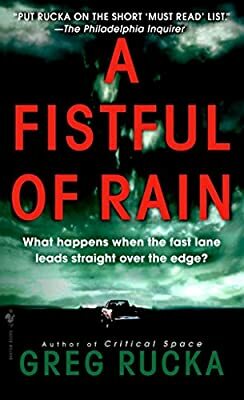 Written with stunning originality, A Fistful of Rain crosses the line separating the guilty from the innocent as it takes us on a breakneck ride of deceit and double cross and--quite possibly--the last twenty-four hours in Mim Bracca’s stormy life.